Exploding unstructured content growth changes the landscape. HP StoreAll Storage with Express Query enables you to tame and mine your content explosion – reducing the cost, complexity, and time to store, protect, and extract business value from massive amounts of unstructured data. Supporting file and object in the world’s most scalable storage platform for unstructured data, HP StoreAll Storage is hyperscale, harnessed, instant, economic storage for today’s and tomorrow’s datacenter. Scale massively without complexity to billions of files and objects, 16 petabytes, and 1024 nodes in a single namespace with centralized management. Bring structure to unstructured data with custom metadata attributes, data retention policies, and autonomic protection for data durability. Use StoreAll Express Query to extract value by finding files more quickly and cost effectively than traditional methods. Scale down costs of storing data over time with policy-based tiering and a modular architecture. The exponential growth of unstructured data is expected to change the IT landscape and increase infrastructure costs. In such a scenario, it can be difficult to manage your data, let alone extract business value from it. To regain control over your data, you need a storage solution that scales affordably and seamlessly. Unstructured data often holds extremely valuable business information. But extracting the value, while controlling for cost, complexity, and time is quite a daunting challenge. HP StoreAll Storage is hyperscale, harnessed, instant, and economic storage purposely designed for large scale enterprise information and industry-specific archives, content depots, and cloud object solutions. The platform includes HP StoreAll Express Query, a breakthrough embedded metadata database technology created by HP Labs, the company's central research arm, that allows organizations to locate files and perform file system analytics up to 100,000 times faster than previous file system search methods. HP StoreAll Storage can massively scale to billions of files and objects without the limitations or complexity of a traditional NAS system. Centralized management allows the administrator to manage not just terabytes, but multipetabyte environments at the highest density possible. There are several features that can help bring structure to unstructured data, such as custom metadata tagging, data retention policies and write-once-read-many (WORM), and autonomic protection for data durability. A key strength of StoreAll lies in Express Query, a feature that enables you to extract value by finding files more quickly and cost effectively than traditional methods. You can scale down costs of storing data over time with policy-based tiering and a modular architecture, which can also accommodate unprecedented capacity growth. HP StoreAll Storage is the ideal platform to simplify archiving, accelerate analysis, and consolidate object and file-based data. Scale out to billions of files and objects, 16 petabytes, and 1024 nodes in a single namespace with centralized management. Custom metadata tagging, data retention policies and WORM, and autonomic protection for long term data durability. File system analytics, discovery, and compliance up to 100,000 times faster using StoreAll Express Query created by HP Labs. Policy-based tiering and cost efficient capacity with a scale out pay-as-you-grow architecture. Efficiently scale out to 16 petabytes of unstructured data and up to 1024 nodes in a single global namespace and manage without complexity via a single user interface. Converge file and object storage within a single massively scalable platform, and with full flexibility to configure file or object access model on a per share basis. Add meaning and value to your data with custom metadata attributes using the integrated StoreAll Express Query metadata database. Drive corporate compliance for your organization with data retention policies and WORM file immutability. Maximize durability of your data with multiple levels of autonomic local and remote, hardware and software-based protection. Find files and generate file system analytics using StoreAll Express Query orders of magnitude more quickly than traditional methods, and without the cost and complexity of an external database. Combine HP StoreAll Storage with HP’s Autonomy Consolidated Archive, the industry’s only intelligent governance layera market-leading meaning-based solution, to drive your records management, eDiscovery, and compliance initiatives directly from your archived data. Reduce your ongoing storage costs while optimizing utilization with transparent and autonomic policy-based data tiering. Flexibly expand storage capacity and performance with the modular “pay-as-you-grow” scale-out architecture and support for the mixing of models in a single cluster. Leverage the rich set of all inclusive data services that provide data protection, retention, mobility, search, and management. Availability features No single point of failure architecture with redundant hot-plug power and cooling, mirrored hot-plug OS disks, redundant bonded NICs, active-active RAID controllers with mirrored cache, redundant disk enclosure I/O modules, RAID5 or 6 data storage layouts with hot-plug disks and global spares, segmented file system, Constant Validation, Snapshots, and Continuous Remote Replication. HP StoreAll OS includes as standard, a rich set of data services optimized for enterprise information and industry-specific archives, content depots, and cloud storage solutions. The all-inclusive data services include: data protection via snapshots and constant validation, data retention via WORM file immutability and policies, data mobility via tiering and continuous remote replication, and data management via HP StoreAll Express Query and quotas. HP StoreAll OS includes as standard, a rich set of access models optimized for enterprise information and industry-specific archives, content depots, and cloud storage solutions. The all-inclusive access models include: NFS, CIFS and SMB, HTTP and HTTPS, WebDAV, REST API, FTP and FTPS, NDMP and ICAP protocols. Plus, object for converged file and object storage in a single platform that can be configured on a per share basis and used concurrently. If none of our support recommendations meet your needs, we can tailor a service solution for your unique support requirements. Only HP brings together deep expertise, proactive and business critical support and a strong partner network—plus, a full set of infrastructure services designed to power a Converged Infrastructure. 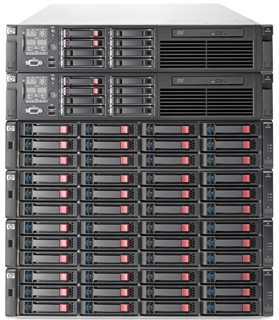 Download the HP StoreAll Storage Datasheet (PDF).